Mayor Martin J. Walsh’s plan calls for 69,000 new housing units by 2030, an increase from the previous goal of 53,000. With Boston’s population growing faster than anticipated and rents continuing to rise, Mayor Martin J. Walsh says he has an updated strategy for easing the city’s housing crunch: Build even more. The Walsh administration on Wednesday will roll out a plan to further accelerate the already robust pace of housing construction in Boston over the coming years, raising its ambitious target for new apartments and condos by 30 percent, with added emphasis on creating affordable housing and protecting lower-income renters at risk of eviction. The move is an acknowledgment that even the largest building boom Boston has experienced in generations — with 18,000 units of housing opened since 2011 — isn’t enough to keep pace with the demand to live in the city. When Walsh first rolled out his housing plan, in 2014, it called for 53,000 new units by 2030, a pace the city is actually on track to beat. But amidst an influx of high-paying jobs and the increasing popularity of city living, Boston’s population has grown even more quickly than expected, with researchers projecting the city will have 759,727 residents by 2030, up from a 2030 estimate of 709,400 four years ago. To house all those people, Boston must build even more residences, Walsh said, so he’s increasing the target to 69,000 units by 2030 — with a goal that 22 percent of the homes, or just under 16,000, be set at rents that are affordable to lower- and middle-income residents. Officials estimate that subsidizing that amount of affordable housing will cost the city $50 million annually — along with state and federal money — and require funding for a new program to help buy 1,000 existing apartments and set them at affordable rents. They also outlined plans to help prevent evictions, and to assist first-time home buyers. But even if the city is able to raise the money, finding places to build all of that housing won’t be simple. Walsh’s plan calls for much of the new housing to be in the outer neighborhoods, where land costs are lower. City officials would focus especially on a few areas — from Suffolk Downs in East Boston to the Readville section of Hyde Park — that are targeted for major development in the Imagine Boston 2030 master plan. Still, in other parts of the city, such as Egleston Square and Glover’s Corner, those plans are under fire from activists who say they don’t mandate enough affordable housing, and could price working-class residents out of their longtime homes. A coalition of those groups met Saturday in Roxbury to crafting a “People’s Plan” that would require as much as 50 percent of new housing in some neighborhoods to be affordable — a level Walsh that administration officials argue could squelch development altogether. The current surge in construction is being fueled by investors from across the globe who are pumping money into Boston, and counting on rents to keep rising. But the continual escalation is bound to eventually end. Rents are already leveling off in some other booming cities, such as Seattle, and there are signs of a slowdown in investment from some parts of the world, especially China. 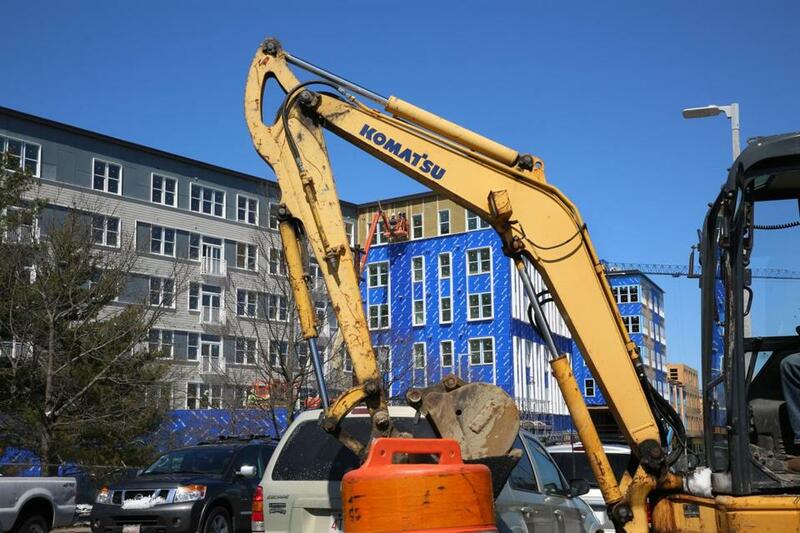 Meanwhile, rising prices for key construction materials such as lumber have some developers warning that building in Boston may become too expensive. A slowdown is inevitable, acknowledges city housing chief Sheila Dillon, who said officials factored the ups and downs of the market into the targets. If demand cooled for awhile, she said, it might actually keep rents in check, and make an apartment a little easier to find. “I would welcome a healthier vacancy rate,” Dillon said. The new goal for 2030 — and the broad approach to providing housing for a wide range of Bostonians — is a good sign that Walsh remains serious about tackling one of the city’s major challenges, said Joe Kriesberg, executive director of the Massachusetts Association of Community Development Corporations, a group of nonprofit affordable-housing developers. But even Walsh agrees that the city’s goal alone won’t be enough to alleviate the crisis. The housing market is regional, and if prices are going to ease, more housing will be needed in suburbs that build at a much slower rate than Boston. The Metropolitan Area Planning Council has projected Eastern Massachusetts will need 435,000 new units of housing by 2040 to meet the demand. Reaching that broader goal has been a priority for the administration of Governor Charlie Baker, which has tried to make it easier for cities and towns to loosen their zoning rules, and for housing advocates who are pushing for denser apartment buildings in town centers, often near commuter rail stations. A growing number of local officials are getting on board with the state’s efforts, said the MAPC’s executive director, Marc Draisen. Along with Walsh, mayors of 13 other cities and towns inside Route 128 have been working with the MAPC to craft new housing targets of their own. Those will be released next month.